A portion of London, a meunière of maritime and fillet of thought. Okay, this is at the high end of unique London property, but our treatise can apply to many capital buildings, whether million pound homes, or more modest abodes. This month’s feature article can be summarised as a treatise in lateral thinking. Combining random ingredients to provide a curious and if you are fortunate, a very productive property outcome. Collecting some seemingly disparate elements and seeing what our culinary metaphor can come up with. By gently infusing the combination with ways in which it may just help you along the road to acquiring your own unique home. Explored in more depth later in this Bulletin. This month has been ecstasy and agony. It was also momentous. Five years ago three friends sat down and started a charity (one from this Bulletin, hence the connection to what is written here). On 15th May 2016 a milestone was reached. Captured on film by a gentleman who flies these new aerial drone film camera contraptions. Marvellous invention. More of that in a while. 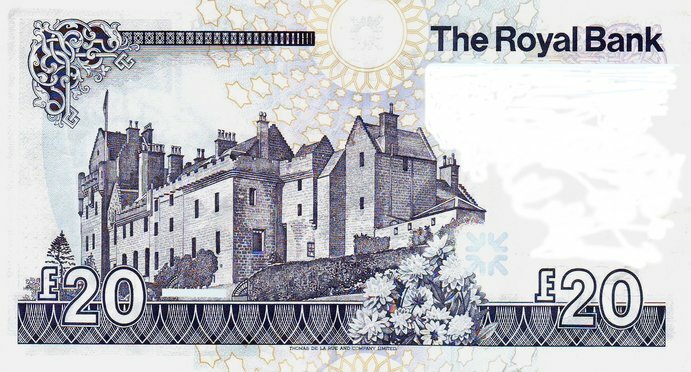 The readers of this Unique Property Bulletin have also had a material role in the success of the charity (many have donated here), for which an enduring thank you is placed here in much appreciation. So why am I starting the current Bulletin in this way? Well, because of personal circumstances I need to spend a fair bit of time thinking. It would be an oxymoron to say forced-meditation, but in effect that is how things have panned out. The good part, in fact an absolutely amazing ancillary by-product is that if you give yourself the grace of time to think – properly and without distraction – often more can be done with the mind than the body. One look at the first video clip in the feature article below illustrates this theory with far more elegance than my mangling words and the English language might achieve. This month’s Bulletin topic is a direct result of thinking time – devoted to problem solving. It then occurred to me to take some ingredients from the past four weeks, and akin to the exotic ways of a top flight chef, see how these elements relate and complement each other. What would the result be? Fair warning, I have as much chance at culinary success as Gordon Ramsay has at going for a week without swearing! Fortunately we are not cooking a meal, but aiming to help readers find their ultimate unique home. Failed To Sell At Auction. Further Price Reduction? 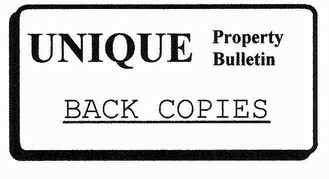 Just been checking some older editions of the Unique Property Bulletin to see what has sold, and what is still available. This odd property was featured by us on put up for auction on 18th October 2015. The price was £195,000 (here) and had been guided down to £100,000 mark for the auction (here). 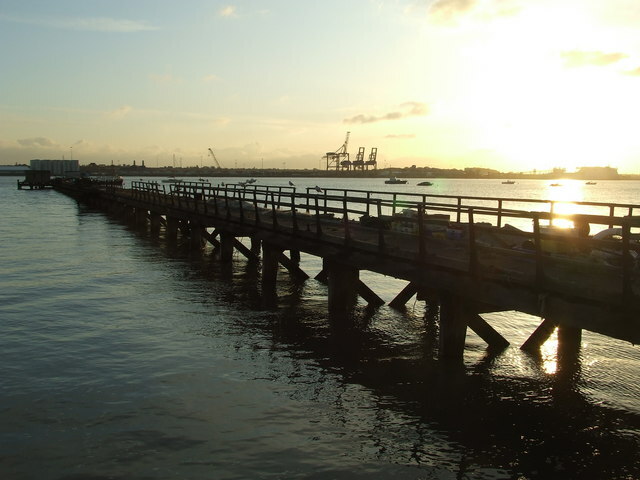 This pier is near to the former shoreside base of HMS Ganges in Shotley, Suffolk in East Anglia is actively for sale at the £100,000 mark. For anyone unfamiliar with naval history, HMS Ganges has a rich and important past for the Royal Navy. More information: click here, plus museum information here and photo montage with much more background detail here. From Sepia – Manual colouring. Now that is old. In light of the unique feature article for this month, it is well worth mentioning this piece of real estate for the potential it has to provide either a residential mooring, or, if you follow the plans, something a bit out of the ordinary. 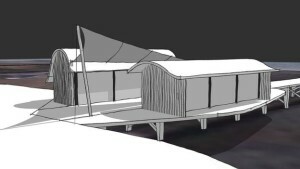 At the time of writing, Bristol Pier has the benefit of Planning Permission (Babergh application no. 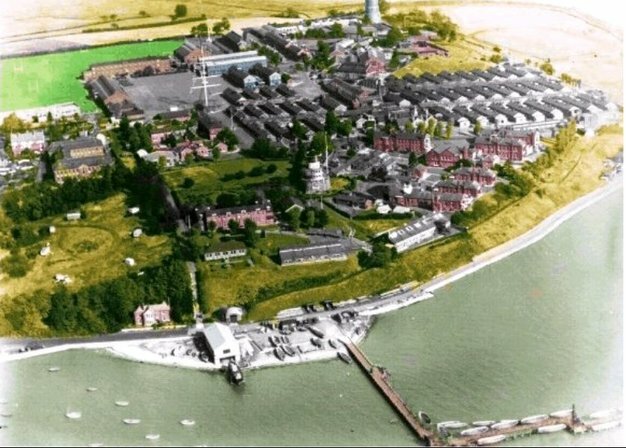 B/13/00234/FUL/GD) for the repair and widening of the first 80′ together with the erection of 2 permanent ‘kiosk’ style buildings of approximately 320 sq ft with A1, A3 or A5 usage and linked by a stretched sail canopy over the central pier access. As we have often said here at the Bulletin, it is not the buying of the boat or the ship that may be the biggest issue – it is finding a suitable berth to site the vessel. With Bristol Pier coming up for sale, someone is going to secure themselves a first class place to have a unique adventure. 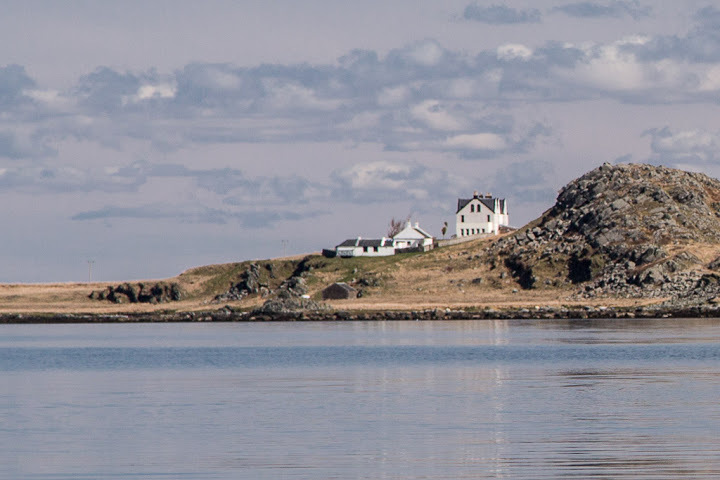 Just imagine living on a delightful little ship at the end of the pier, with folk of like-minds on their boats popping across to have a coffee with you – or perhaps an Uisge beatha – and a nice old chat about the world, life and all things nautical. At the same time, it may possible to derive a very useful income from the pier itself. Especially if the two kiosk idea is something that you go ahead with. Guide: £100,000. FTSAA – Failed To Sell At Auction. Perhaps time for a haggle. Original Bulletin Source Article: Click Here – second listing into the page of that edition. 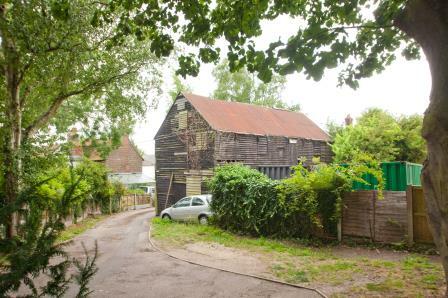 Canterbury Barn At Ash, Kent – With Planning Permission. Here is a detached barn believed to be some 200 years old. 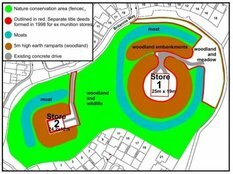 It has full Planning Permission from Dover District Council under ref: DOV/13/00327, dated 18th July 2013, for the change of use and conversion to a single residential dwelling (subject to conditions). A copy of the Planning Consent and proposed plans are available for inspection at the Auctioneer’s Office or via Dover District Council’s website where further information may be obtainable. Location: The Barn Adjoining 92, The Street, Ash, Canterbury, Kent, CT3 2AA. At Unique Property Bulletin, our core promise is to help you find, fund, and have fun with unique property. This Bulletin is aimed at helping you find the ideal property. However, to assist in funding, we have a tried and tested method that has proven to work on many previous collegiate property adventures. Thereby building up each member’s reserves. The long term goal being for each individual participant to have grown funds to the point when their own specific genre of unique home becomes affordable. 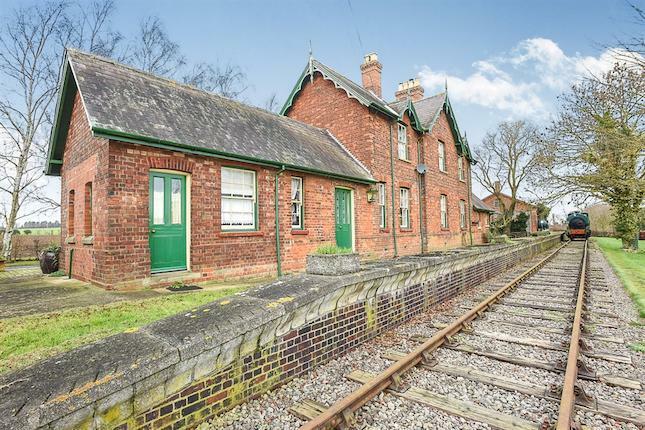 This former railway station has been converted to a lovely home. Originally a Great Northern Railway property built around 1872. Not so much the end of the line, more likely the beginning for a new owner. 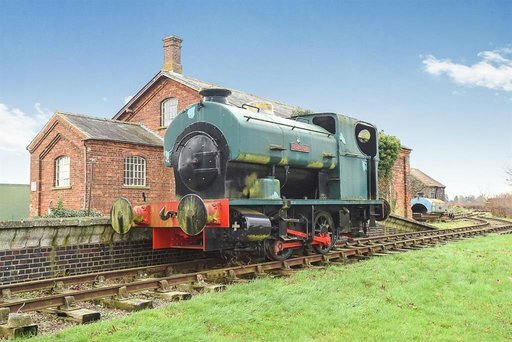 Redolent with opportunities – included in the sale are approximately 1.2 acres of land, with a detached engine shed and barn being of particular interest (subject to planning permission). The railway locomotive pictured is available for purchase separately – subject to negotiation. Contact Hurfords Estate Agency – Tel: 01733 380956. 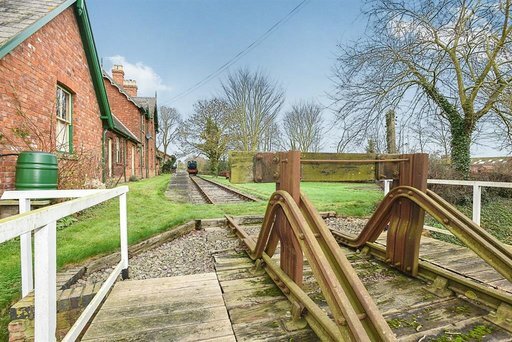 Please can folk mention to estate agent that they found this former railway station for sale in Unique Property Bulletin. This helps us keep this publication free for all readers. Absence…. Apologies from the Unique Property Bulletin volunteers being off site for a while. The result of a sad family occasion. After a period of mourning, we are now returning to as near normal service as possible. However, the next FULL Unique Property Bulletin has now been put forward to 9pm Sunday 7th August 2016. Are you currently renovating a unique property or about to start a unique renovation project? A London based production company are seeking participants for a new Channel 4 property series. 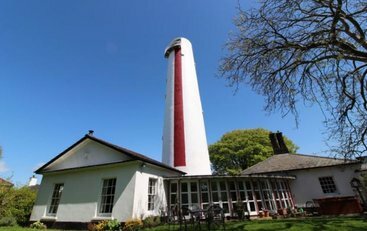 We are looking for individuals who are taking on unique and unusual properties from former public loos and train stations to lightships, lighthouses or unloved church buildings. If it’s quirky and unique then we are eager to hear from you! Alternatively call/text Nikalas on 07527 280 133 for more details. We still have problems understanding why some picturesque idylls have only a couple of thousand clicks, and then literally, a bog standard building gleans over 10,000 views. There is certainly a big flood of excremental erections onto the sale list as this article reports (here). Maybe the penny will drop and an answer as to why these diminutive dumpers have such a following will be resolved. If you know why these old loo buildings are popular for property purchasers, please let us know (click here to email). In the meantime, to ensure we are not asleep on the jobby, here is a tidy wee property for auction in Ramsgate. 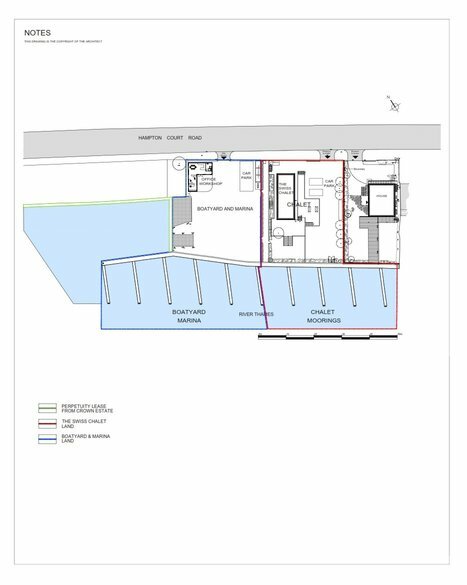 This example has planning permission from Thanet District Council, under ref: F/TH/16/0196, dated 29th April 2016, for the change of use from public conveniences to retail (A1). Not sure whether it would be possible to go for a residential permission. You would need to contact the council’s planning department to find out what their policy is (here). Location: Former WC, High Street, St Lawrence, Ramsgate, Kent, CT11 0QG. Contact Clive Emson Auctioneers – Tel: 01622 608400 -Dave Henwood or Kevin Gilbert. 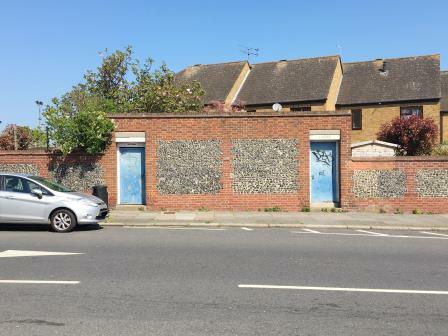 Please can folk mention to the auctioneer that they found this former public convenience for sale in Unique Property Bulletin. This helps us keep this publication free for all readers. Click on the picture above to watch the trailer for Derren Brown’s Zombie Apocalypse television programme. 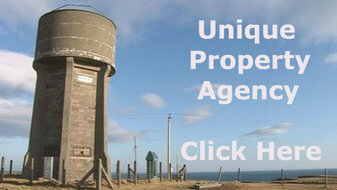 Click on the picture above to study the video tour of this nuclear bunker for sale. 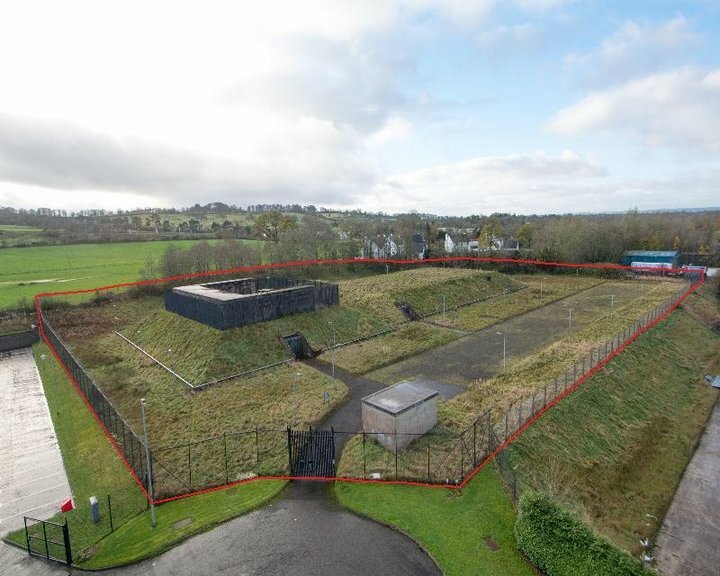 Agency Description: Northern Ireland’s only nuclear bunker of its type. 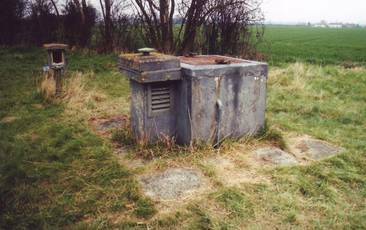 Designed and constructed as part of UK Government Nuclear Civil Defence Planning. Capable of accommodating 236 personnel for extended periods. 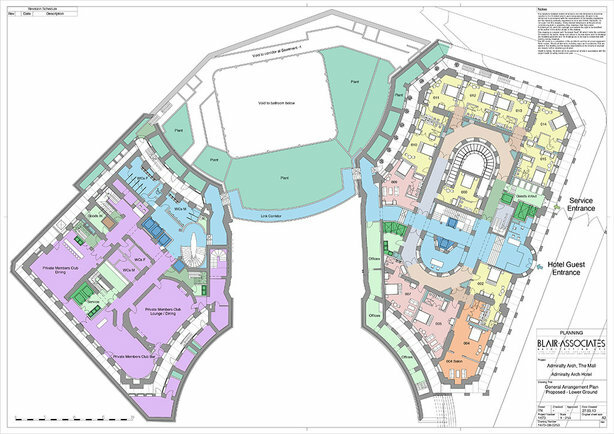 Approximately 46,383 sq ft built on two levels, with the lower floor completely underground. 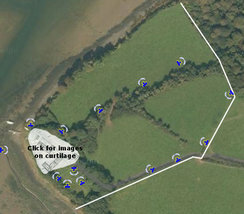 Set on a self contained site of approximately 3.74 acres. An extensive range of the original fixtures and fittings included in the sale. During the Cold War, the UK government ordered the construction of thousands of underground complexes. Almost 1,600 nuclear monitoring posts of this type (here) and 36 control posts for military and civil defence purposes were built across the UK between 1955 and 1965. Additionally, during the 1980s, the government also funded a programme to create emergency Regional Government HQ centres in strategic locations. The subject property was commissioned in the late 1980’s, opened in 1990 and is believed to be one of the last and most technically advanced bunkers built in the UK. It is Northern Ireland’s only nuclear bunker of its type and extends to circa 46,383 sq ft over two floors, providing living accommodation for up to 236 persons. The lower floor is completely underground and the upper floor is mounded over with c. 1 metre of earth. Since completion in 1990, the building has been maintained in a ‘fit and ready state’ for any such emergency but was never actually used for its intended purpose. As such over recent years it has been subject only to essential maintenance as required. Internally the building is fully equipped for purpose with most original fixtures and fittings still in place as built. The building has 3 points of access, all via interlocking double blast doors. Internally the bunker provides dormitories, male and female WC’s, commercial kitchen facilities, BBC audio visual broadcasting facility, conference facilities, air filtration systems, conference rooms, decontamination chambers, plant rooms and oil storage. The bunker is served by an impressive array of life support systems from air filtration plants, back up generators and water storage tanks. In the event of a nuclear attack the building could have operated in a closed down situation for approximately 30 days. The services and life support systems were designed to make the building and its occupants self sufficient for this length of time. Contact Lambert Smith Hampton – Tel: 028 9026 9228 – Philip Smyth. Please can folk mention to estate agent that they found this former underground nuclear bunker for sale in the Unique Property Bulletin. This helps us keep this publication free for all readers. Perhaps give our friends at www.upfs.co.uk a go. If you have an unusual building, please consider using the services of our friend’s new estate agency. Buildings such as the Strathy Point Lighthouse Engine Room conversion have been sold directly via this website – along with a lot of help from our friends. Click on the picture above to watch the video presentation. The new estate agency is sponsoring the Bulletin. By helping us, this in turn can help you. Please consider placing your unique property for sale with our friend’s new estate agency. Thank you. Anyone who knows the volunteers at Unique Property Bulletin will understand our passion for libraries. It is, in part an educational tragedy that these important centres of learning are becoming fewer in number. Though this is not all bad news. The reason for their demise could be characterised as an explosion in the availability of knowledge on the internet. Just a readjustment of the learning literary delivery process (that sentence sounds terrible when repeated in the head). Could be written better as: a brilliant and accessible redistribution of the way in which we all learn. Some Bulletin readers will also know of one offspring from our earlier unique property adventures: the closed shop reopening initiative. Funded to a large extent from the profits of previous syndicates (here). One example that we would like to apply at a closed library is a similar exercise to that which we ran when an old, closed pub was bought by our group. 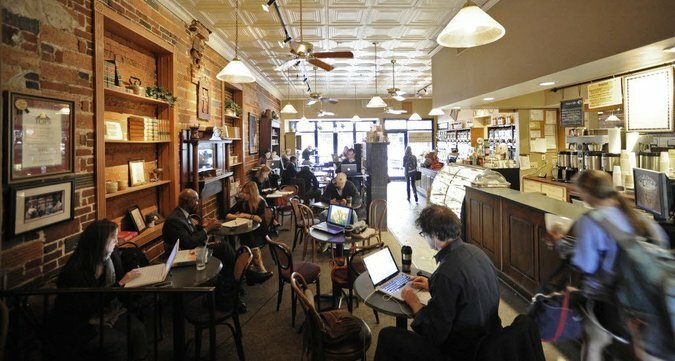 It was turned into a coffee bar and internet cafe (click here to read of that renovation project). Can bring an old, closed library back to life. With our own internet cafe and coffee shop building, after renovation was complete and the reopening day had passed, a big surprise was the fact that £40,000 worth of coffee got sold in the first 10 weeks. That was the equivalent of the whole refurbishment cost transforming a derelict pub into a vibrant place to visit. So where are we going with this? 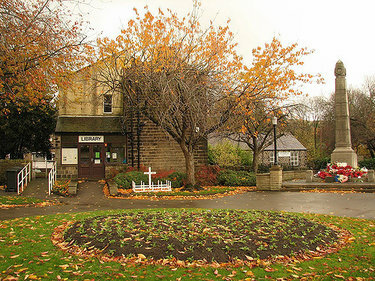 Well if the Silsden library were nearer to where the Unique Property Bulletin is based, we would be looking to buy, renovate, and create another new coffee shop and internet cafe – with a library plugged into the project. 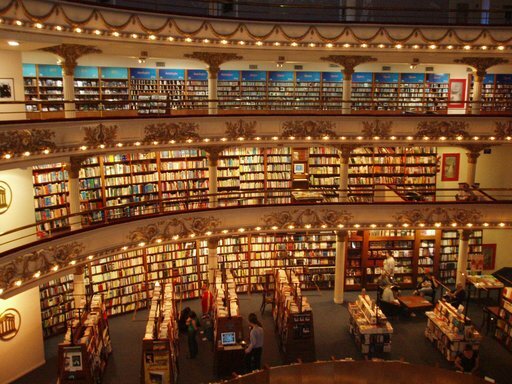 Now that would be a good outcome for any closed library. Instead of losing a community facility, it would reopen. All right, the library would be substantially changed, but there would be the retention of a learning hub, and the social function would be re-ignited. All for the love of libraries. The good thing about Silsden library is it already has a residential element for owner occupation. The guide price of £80,000 isn’t that bad a starting point for a home and place of work. Plus you get a lot of interesting customers. So that monastic element that can be the lot of a person who’s job is running websites is then balanced with a good and healthy amount of social interaction. If you end up buying the Silsden library and emulate the success we narrated on our sister website (here), please let us know? Thanks. Contact Roy Pugh Auctioneers – Tel: 0844 2 722444. 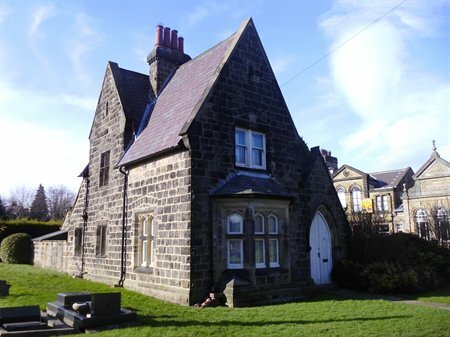 Please can folk mention to auctioneer that they found this former library for sale in the Unique Property Bulletin. This helps us keep this publication free for all readers. Please note the property for sale is the three storey detached building to the right of this photograph shown above. The lighthouse tower is NOT included in this lighthouse shore station building sale – just the former lighthouse keeper’s house. 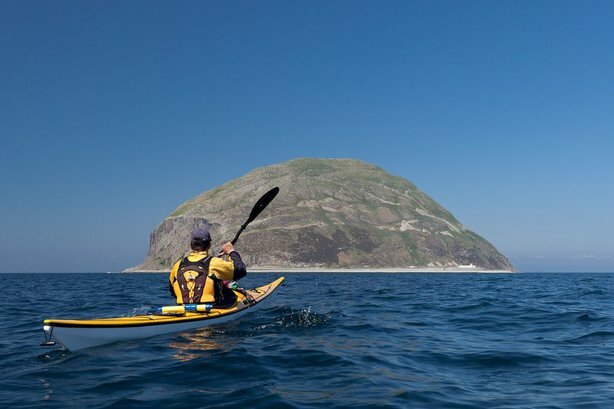 Getting to the Island of Jura can be a lot of fun. 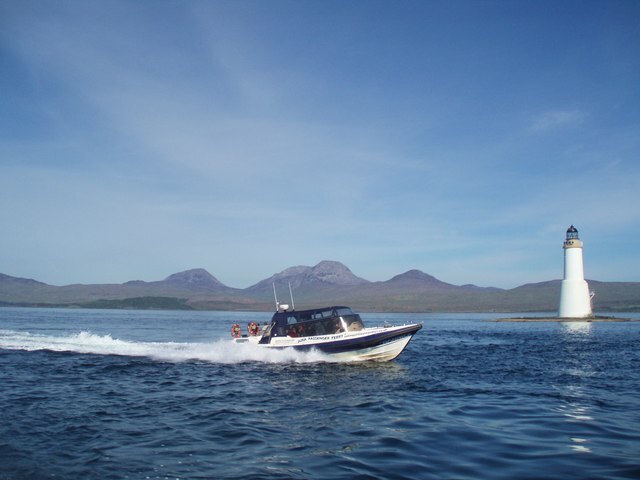 Whether directly from the mainland by small fast rigid inflatable boat, or the more normal journey in the big ferry, past some beautiful views from mainland Kintyre to the Island of Islay and then onwards with a hop across the Sound of Islay in the wee ferry to Jura. The owner of Skervuile Lighthouse Keeper’s House contacted us directly with this picturesque property that he has now placed for sale. 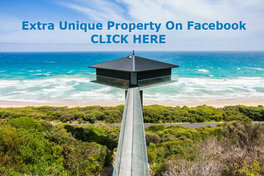 At this time, it is exclusively for sale via Unique Property Bulletin and our Lighthouses For Sale & Rent websites. Please note, it is the former lighthouse keeper’s house that is for sale and NOT the offshore diminutive Skervuile Lighthouse tower. 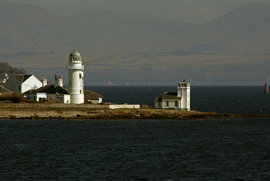 Location: Skervuile Lighthouse Shore Station, Craighouse, Island of Jura, Argyll, PA60 7XZ. ARE YOU A NEW READER OF THIS BULLETIN? If you have just arrived at this website, a hearty and warm welcome. This very page has the main Unique Property Bulletin for you to read, and we published a fresh edition on the first Sunday of each new month at 9pm. If Twitter is your thing Click here. 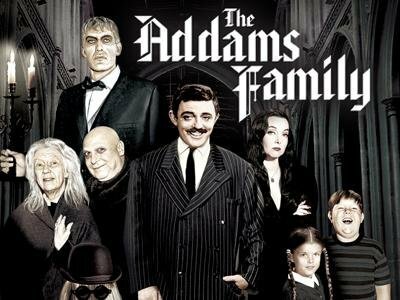 By the way, neither the volunteers, nor readers at Unique Property Bulletin are related to the Addams Family. Church building of traditional design at the front of the site, with a two storey hall building at the rear. The rear building has to the ground floor a smaller and a larger hall, with 6 separate meeting/storage rooms and a kitchen. At first floor is a committee room and an office. 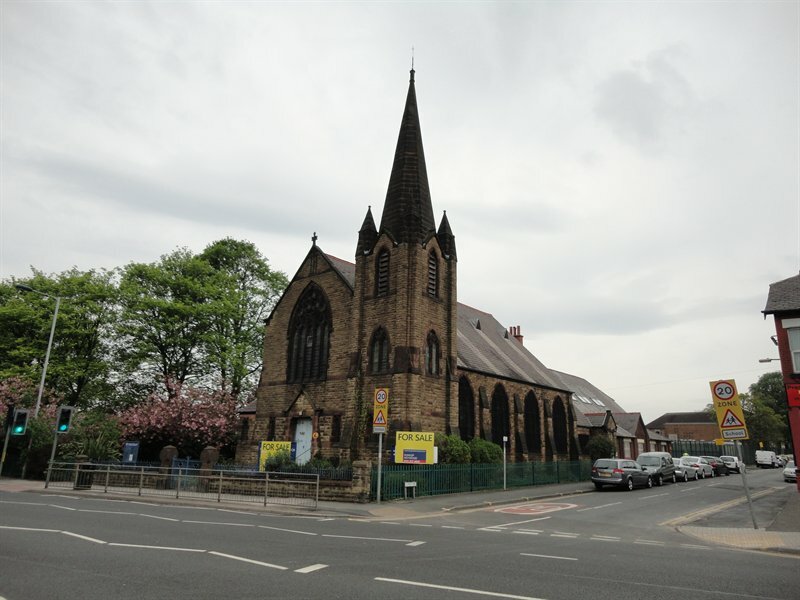 The church building has a date stone of 1896 and is constructed of stone outer skin under a slate roof. Internally, there is headroom of up to 32 Ft. The hall to the rear was built about 90 years ago of brick under a pitched slate roof. This building has a considerable amount of floor space. Ater a little research, it appears that the original price sought was £400,000. That was in April 2015. Since then, the guide price has been halved (here). Contact Pugh & Co., Auctioneers – Tel: 0844 2 722444. 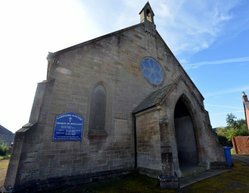 Please can folk mention to auctioneer that they found this former church for sale in the Unique Property Bulletin. This helps us keep this publication free for all readers. Our Aim: To help you find unique property that suits you. 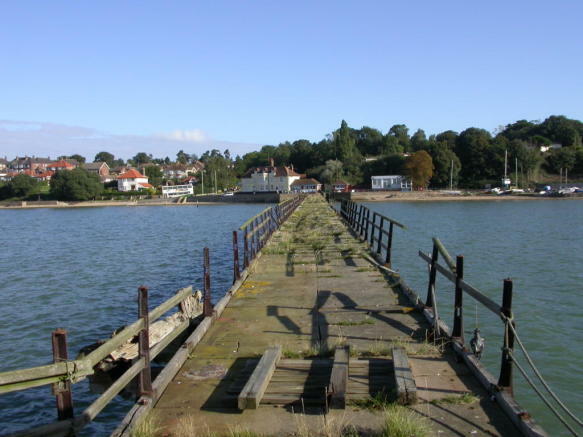 For example, an old pier coming up for sale – to moor your house boat. This old pier might be just the property to buy, if you live on a boat and need a place to moor it. 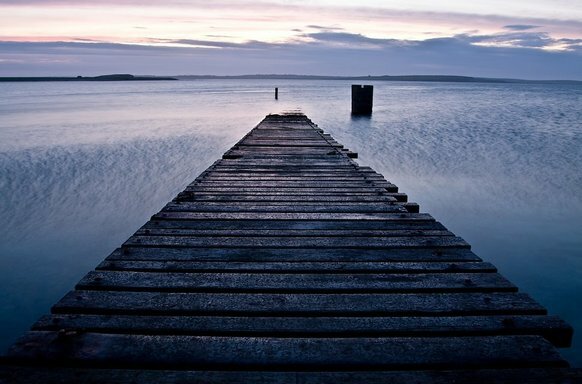 Not sure what you might do with this old pier, but it is just one of hundreds of properties that our extra article can help you find. Better still – we show you how to focus your search on the part of the country that you prefer. London or the Lake District. Manchester or the Norfolk Broads. Cardiff or the Yorkshire Dales. Our extra feature will help you source more properties that are likely to suit your bespoke desires. You will need a password: Click Here. The passwords are good for several other special pages as well. For this edition of Unique Property Bulletin we have the Boulder House. Located in Arizona, USA. This inspirational residence shows what can be achieved when marrying a building with it’s natural surroundings. This overseas property was for sale in 2015 (but has since been sold and is off the market – for the time being. Many owners move after an average of 7 years in a particular house, so it may be for sale again some time. Boulder House also has around 9 acres of undisturbed desert. This home is integrated into a massive outcropping of granite boulders that make up over 60% of the structure. Formerly offered for sale by Preston Westmoreland at Russ Lyon Sotheby’s International Realty. Further details and pictures: Click Here (archived here). We revise, update and ADD to this monthly Bulletin during the course of the edition with relevant changes. Please check back to this spot during the month to ensure you are not missing anything. Please note, in each edition of the Bulletin we feature the work of a unique architect. 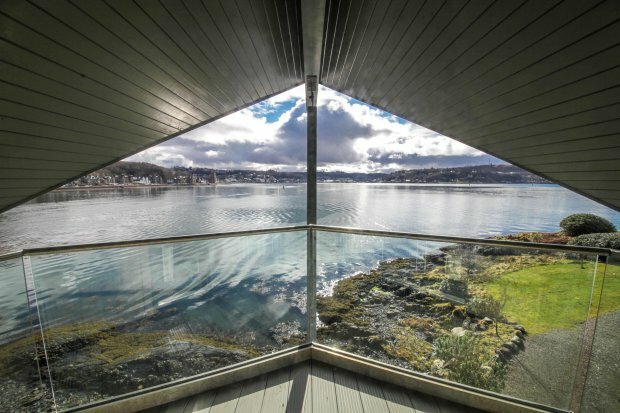 These properties are usually NOT currently for sale, but are included to help inspire readers as to the talent that abounds when the mind of a good architect meets the imagination of a unique property person. Something that little bit special is often created by the synergy. In this instance, we have a unique piece of architecture that is for sale. A personal confession. 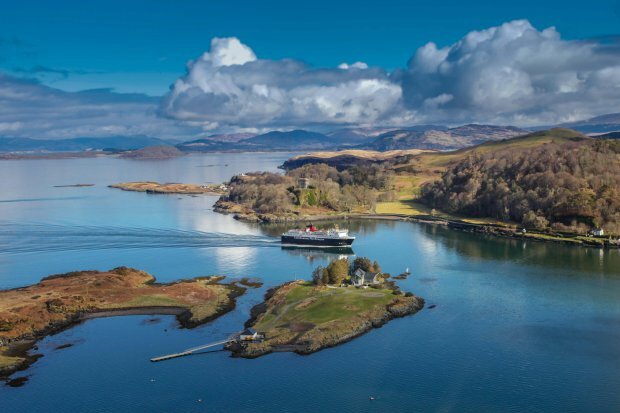 I have sailed passed this island many times when travelling to Mull and have looked at Rudh-A-Chruidh with admiration on a number of occasions. Were it another era (and the bank balance at pre-2007 levels), I would happily be putting in an offer. It is easily in the top ten of unique homes from 25 years of publishing this Unique Property Bulletin. Not just because of the style and imagination invested in this building, but the location is exquisite. This part of Kerrera is in and of itself a tidal islet that links to the main island. From there it is short hop across the water to a splendid town called Oban. Here you can find many, if not all the local amenities you might seek. 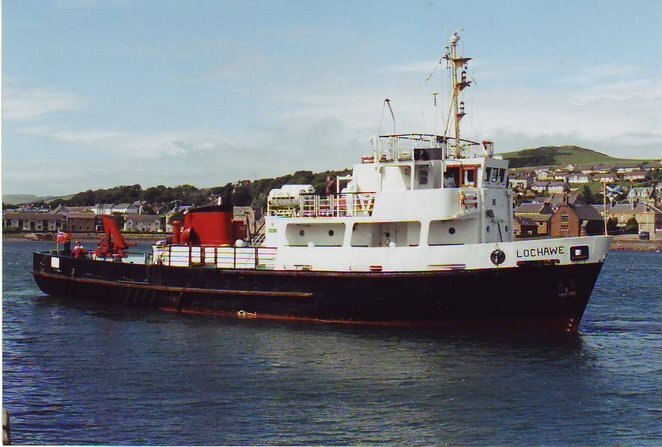 Plus Oban happens to be ‘ferry central’ – in that there are many services that leave the town for other islands that surround this part of Scotland. A veritable treasure trove for exploring and island-hopping. That is when you are not pre-occupied with the near hypnotic sea views from the magnificently designed feature windows in this bespoke building. 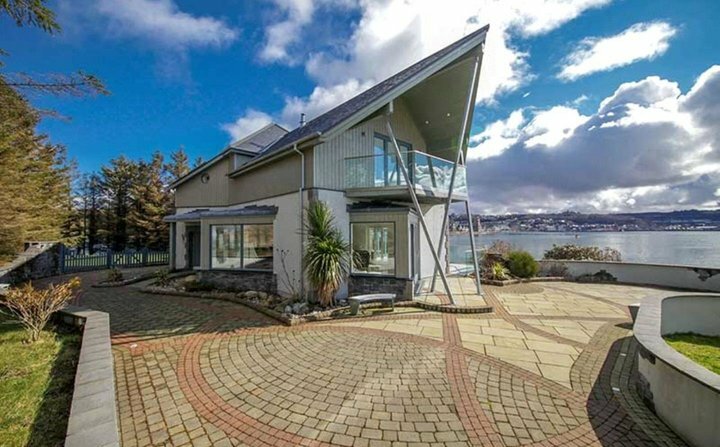 The detached house has 3 en suite bedrooms; boathouse and mooring; plus a private pontoon and helicopter pad. The land included in this sale extends to approximately 4 acres. Agency Description: Rudh-A-Chruidh is a charming tidal island which at low tide is linked to Kerrera by a causeway. Relatively easy access from Oban Harbour. This is probably a reasonable excuse to buy that boat you have been yearning after. A purpose built helicopter pad also allows access by air. 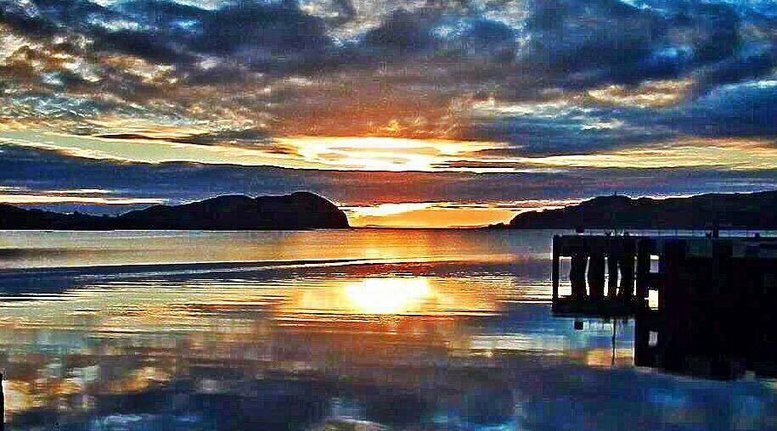 Oban offers a good range of shops and professional services as well as secondary schooling and a railway station with regular services to Glasgow and London. A sleeper service runs from Fort William. Oban is also the ferry terminal to the Western Isles. There is a small local airport at nearby North Connel and Glasgow International Airport has a wide range of domestic and international services. The frame around it is none too shabby either. 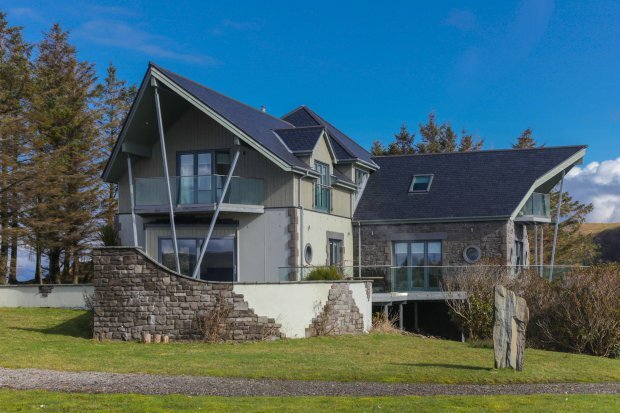 In 2012 a new house by Mull landscape architect Norman Hickson was built to an exacting standard and with a remarkable specification. 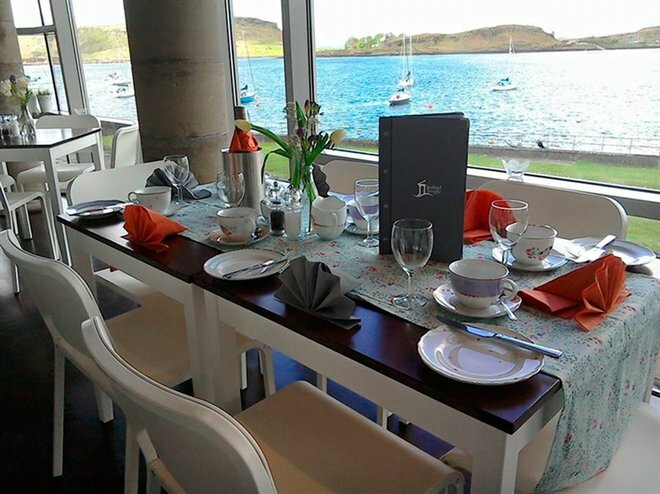 It sits proudly above Oban Bay taking full advantage of the sublime views over the bay and the Sound of Kerrera. Built under a slate roof, the accommodation is formed over two levels and presented in immaculate order. The reception porch has double doors to the main reception hallway which has an American feel to its layout, with drawing room, dining area and kitchen being open plan. They share the same tiled floor with underfloor heating and all enjoy wonderful open views over the bay. The sitting room has a wood burning stove and French doors onto a substantial decked terrace. On the first floor are three bedrooms all with en suite facilities. The master bedroom is of particular note with a vaulted ceiling, dressing area and balcony. There is a substantial basement which provides excellent tractor storage. 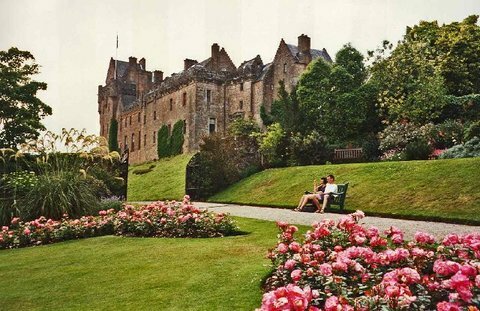 While at one time the land of Rudh-A-Chruidh would have been used for grazing, today it has been meticulously planned and planted as garden grounds of which some parts are more formal than others. Norman Hickson is also a renowned landscape architect and has carefully laid out the pathways, lighting and feature standing stones to create magical but easily maintained gardens. Click on the picture above to watch the video presentation. 35 seconds into the film is Rudh-A-Chruidh. Contact Savills Estate Agents – Tel: 0141 222 5875 – Caroleanne Gallagher. 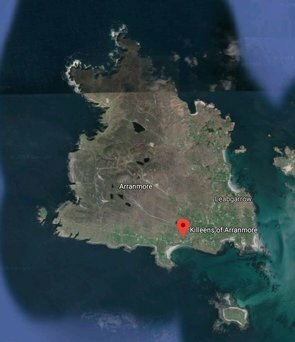 Please can folk mention to estate agent that they found this island property for sale in Unique Property Bulletin. This helps us keep this publication free for all readers. 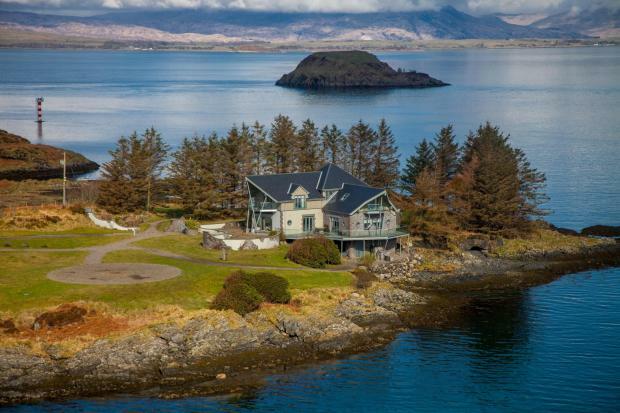 As a postscript to the previous listing – that beautiful, near-million pound architect designed house on Kerrera Island. Within clear sight from the island, across Oban Bay are what some folk call Ogs Bogs. I can almost hear you sigh and say: oh, he’s back on the bog theme again. Well yes and no. Remember earlier in this Bulletin, I did mention how popular these diminutive public convenience buildings are amongst readers of this publication. There are numerous theories as to why this might be. This particular facility was more than just a public convenience. Indeed received wisdom is that the toilet part was little more in square foot area than might occur in any former local authority building. The Temple property was, by all accounts used as part of a promenade walk with folk sitting for a while. The current owners have certainly done the place proud. Refurbished to a very high standard, and the views. 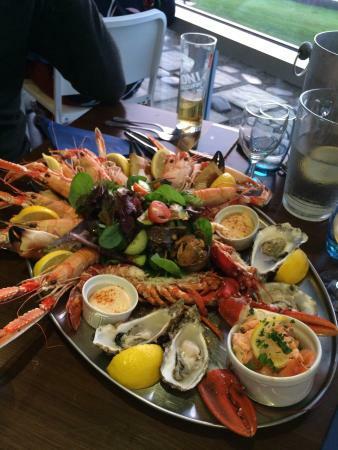 Not just across the water, but inside the seafood platter is quite a feast for the eyes. This unique building doesn’t seem to have much room to add a residential part, but as a lifestyle business, it represents a valuable proposition. 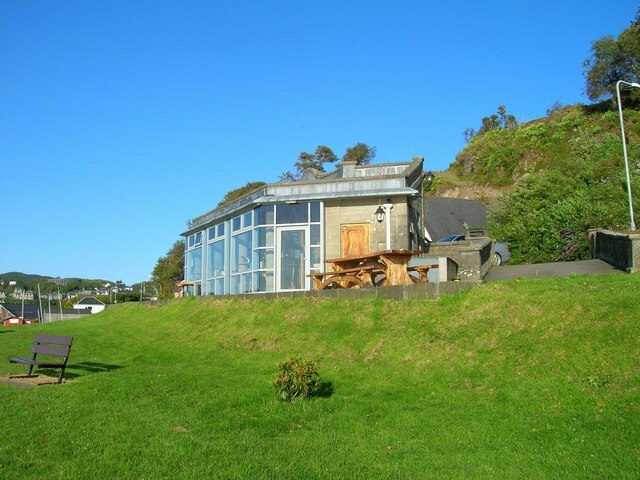 If the idea of a owning and running a beautiful little seaside restaurant appeals to you, then you could always buy this unusual place. Whilst doing so, in the same shopping basket buy a small flat or house. There are a good selection of places to buy and live nearby (here). All in all you should have change out of £200,000 for the whole lot. There are not many deals where you buy a house, a business and a job – all asset backed – for less than £200,000. 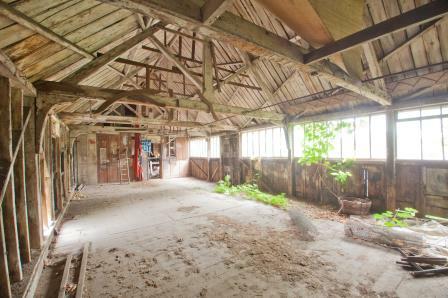 Writing this, and looking at the pictures, I’m tempted to put a bid in to buy the place. Though Bulletin readers have first dibs. 24 covers. Potential for outside seating. The Seafood Temple was established circa 10 years ago, with the current owner taking over the business in June 2011, so the business is therefore well established. 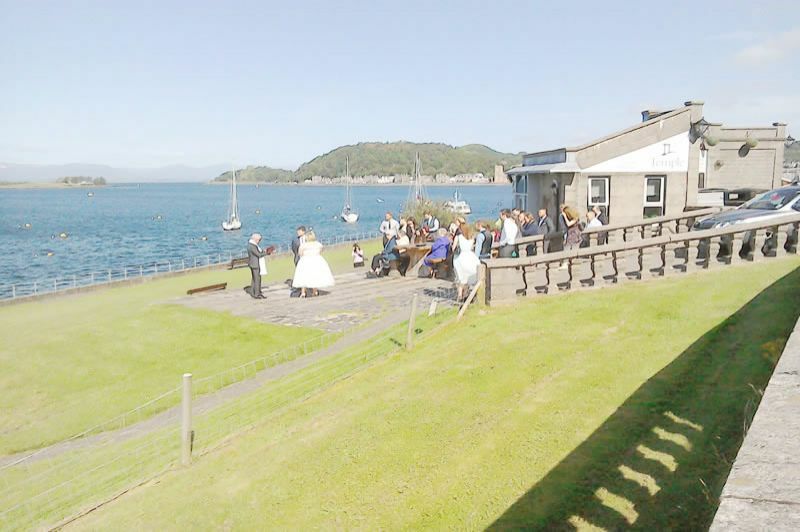 In this time, the business has developed an enviable reputation for its food and service as well its unrivalled views, resulting in many awards, and has established a good local customer base supplemented by the high levels of tourists and day-trippers who flock to Oban, particularly in the summer months and school holidays. So from the Unique Property Bulletin, we wish the seller’s good fortune in their endeavours. 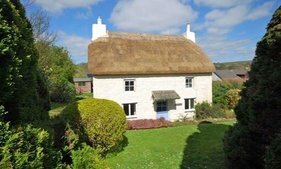 Lock Cottage is a good example of Sir John Smith’s core purpose in founding the Landmark Trust in 1965. He was so maddened by the destruction of Thomas Telford’s Junction House on the Shropshire Union Canal that he set up the Trust with the aim of restoring historic buildings. This particular survivor lies on the Worcester & Birmingham Canal, built between 1790 and 1815, which runs for 30 miles from Diglis Basin in Worcester to Gas Street in Birmingham. Canals are a wonderful demonstration that beauty and utility can be combined. Today only narrow boats and towpath-walkers will pass by Lock Cottage. As the parking is a little walk away a wheelbarrow is provided to help transport your provisions. 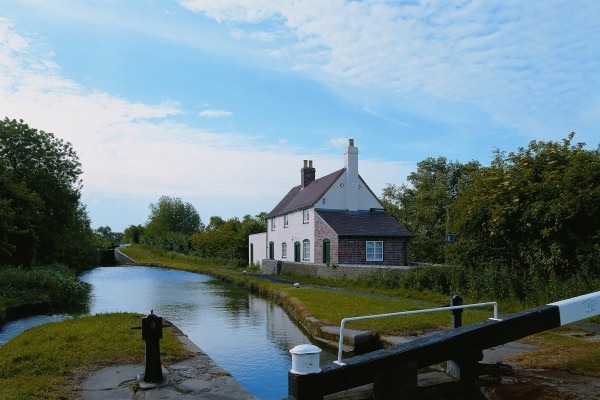 We hope that this lock cottage will give you a taste for travel by canal, which is the prime way to see England at walking pace without actually having to walk. Bromsgrove isn’t far away at all and Lock Cottage is in a perfect position for exploring some beautiful historic properties. 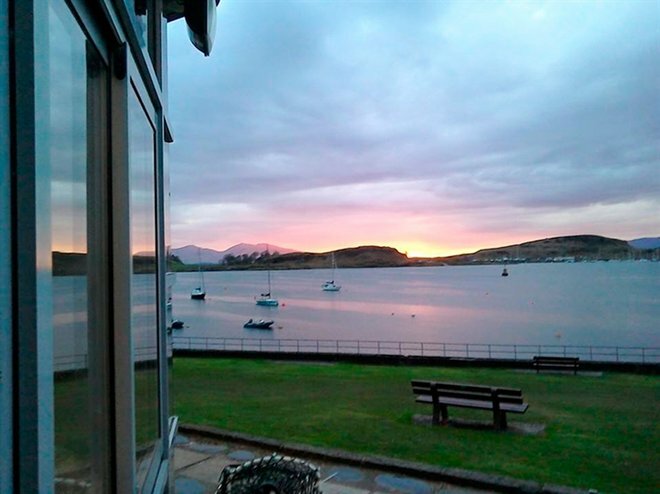 Holiday Accommodation: 1 Twin, 1 Double – Sleeps 4. 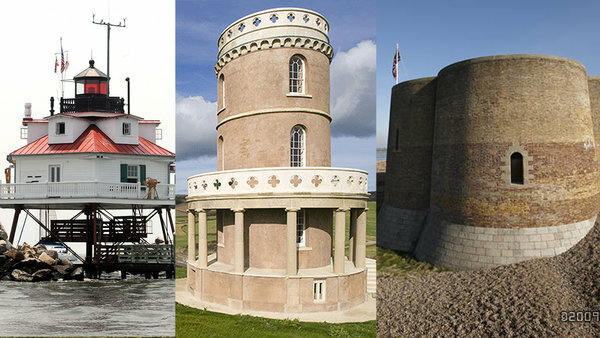 Contact the Landmark Trust: Click Here. 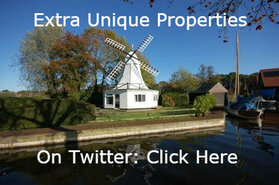 Please can folk mention to the owner that they found this lock cottage for holiday rental in Unique Property Bulletin. This helps us keep this publication free for all readers. A portion of London, a meuniere of maritime and fillet of thought. 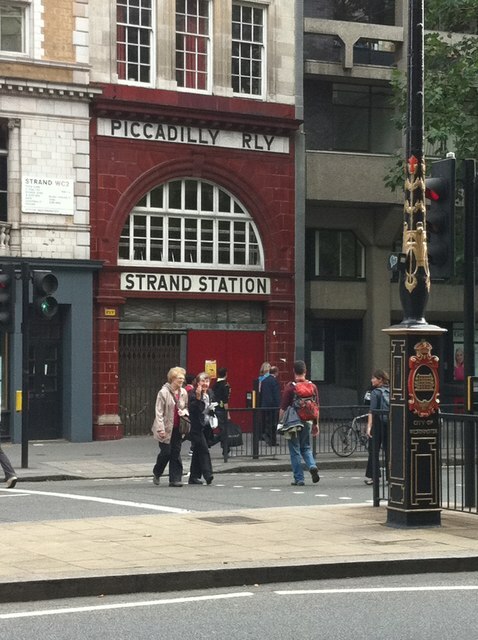 The Grade 1 listed iconic London landmark was one of several snapped up by astute London property developers. The capital is an incredibly competitive place to carry out property purchase and sale. Plus you generally need to add a nought or two to the purchase price when compared to the rest of Britain. A £60,000 rural house can cost £600,000, or even a £6,000,000 for a near identical property when located within the environs of the M25. But mere mortals can still buy property in London, and for that matter the other great cities of Belfast, Bristol, Cardiff, Coventry, Edinburgh, Glasgow, Leeds, Lincoln, Liverpool, Manchester, Nottingham, Oxford, Plymouth, Portsmouth, Sheffield, Southampton, Swansea, Truro, Winchester, York and more. One way is to find out well in advance, what municipal or government buildings will be coming up for sale. A couple of ways this can be achieved are via Unique Property Manual (here) and/or our extra articles online: click here and here. 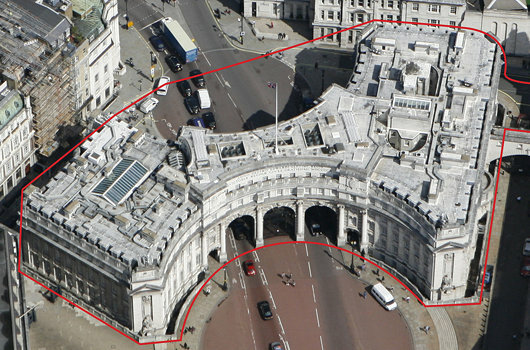 Admiralty Arch is one of the most high profile of these. The big deal has been done (here). Though if you are a person that enjoys a bit of lateral thought, here is a tasty example of what the old grey matter can come up with. 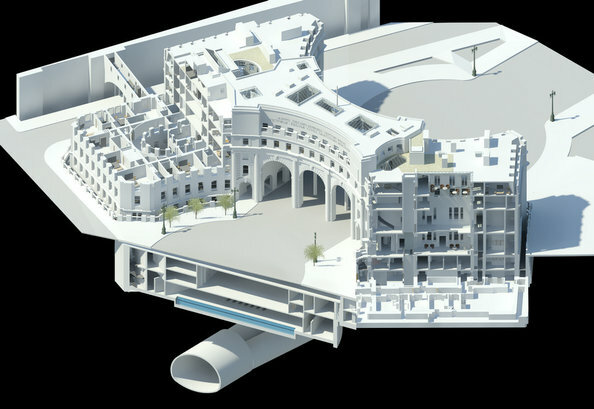 Read the small print and you will see that as well as a luxury 5 star hotel conversion, the developers of Admiralty Arch are proposing residential units within the massive building (here). If this is your style, then at least you have several months head start on other prospective buyers of a luxury pad that gives your next door neighbour as the Queen at Buckingham Palace. Of course, the London property scene is like no other in the British Isles. We do have millionaires read the Bulletin, and yes Admiralty Arch and other capital landmark conversions may well be of interest. But for most of us, the type of unique property our budgets can cope with are more traditional in price level. Though one principle still stands. Advance knowledge can be a deal maker. No matter where you reside, or are looking to move to in the UK, there are deals to be done that will secure your ideal home. In this pursuit, what do we have available to us for this month’s Bulletin? We have already touched upon the London property market. A whole swathe of government and local authority property is being sold off. Much is to be subdivided, and therefore it is a good idea to keep an eye on your local planning applications. You will possibly achieve that golden dynamic of several weeks advance notice for capital property development being converted into flats – with you managing to secure pole position at the front of the queue. But there is a bit of a gap here. Mind the gap as Londoners might say. By that, I mean the seriously problematic issue of being able to afford to buy a home in London (or many of the other great cities in the United Kingdom). Hold that thought a moment. Let it simmer. Just moving to maritime matters for a few paragraphs. The essence of this article is putting together random ingredients and see what they bring about. One of the elements this month was the 700 mile trip and return of TS Queen Mary to her home port by the charity we set up for this purpose. 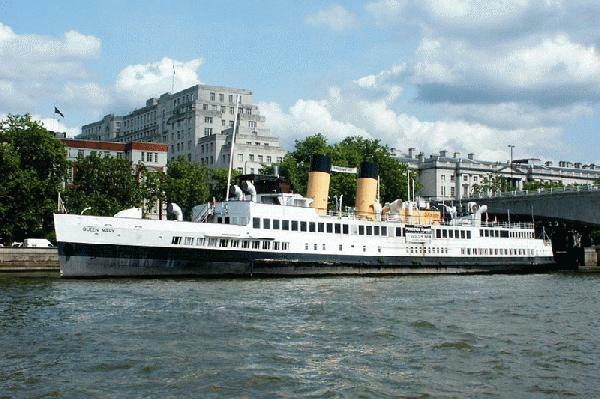 Many years ago she served as a popular London landmark, moored at the Victoria Embankment (here). 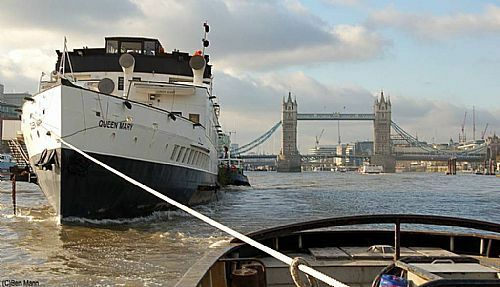 She would probably still be in London were it not for the innate value attached to the mooring on the river Thames. That specific pier at the Victoria Embankment was worth a great deal of money. It sold, and the TS Queen Mary became surplus to requirements. Subsequently to languish in the Tilbury Docks for what seemed to be an eternity. Indeed the only outcome for a while seemed the scrapyard for this genuinely historic ship. 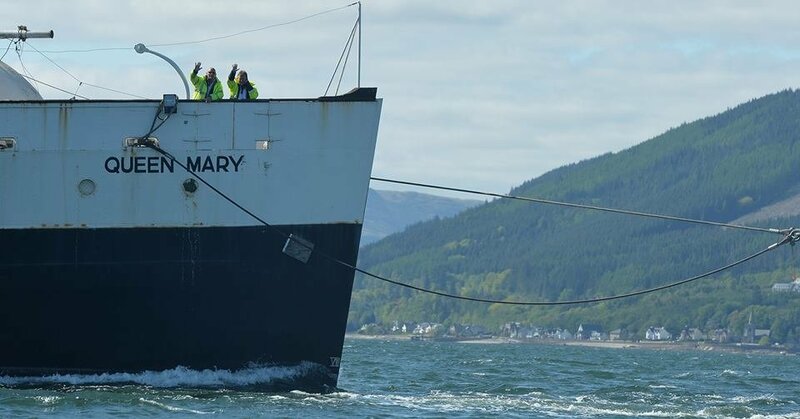 Then at 14.50 on 11th May 2016, she smoothly slipped her lines, and with a hawser attached to the fine wee tug Venture started an epic voyage half way around the country. The TS Queen Mary sailed back to her home port of registry, and the arrival was something that none of the charity’s founding trustees, nor current trustees and supporters could possibly have imagined. Four days later, the TS Queen Mary arrived back to the place where she first set sail from 83 years earlier. The homecoming events of 15th May 2016, brought people on the quayside to tears. The flotilla that sailed with her for the last few miles home and wonderful memories shared by so many on the Sunday gave way to a quiet night at her new berth, the James Watt Dock. Personally, I will remember the following day with as much fondness as the main Sunday. On Monday, things were strangely quiet aboard the TS Queen Mary. Just the ship and two old salts. A heartfelt thank you to my friend and fellow founding trustee Captain Calum Bryce. All the crowds that lined the quayside had gone home. We spent the day on the ship sorting out lighting, generators, bilge checks etc. I am pretty knackered with the back surgery and yet Calum was kind enough to give me the grace of time on that marvellous ship. Forever grateful for that. Ended up in Ninewells Hospital at the end of the week. Hence the ecstasy and agony comment earlier. As far as the TS Queen Mary operation goes, the heavy lifting between 2011 and 2015 has been done by the main/current charity trustees along with a huge amount of help from the likes of patron, Robbie Coltrane, the Tilbury Port Authority, Dales Marine, that amazing effort by the tugmaster if Venture with his crew and so many people who have an abiding love of this old ship. How a lump of metal can bring grown men and women to tears is an enigma to me, but this whole endeavour has been complete with the triumvirate of blood, sweat and tears. “But what has all this reminiscing about old ships got to do with me finding an affordable and unique place to buy in the city”? A few readers might just be ahead of the pack with the answer to this. But please let me torture you with one modest and last tale from the deep blue water and those that sail upon it. 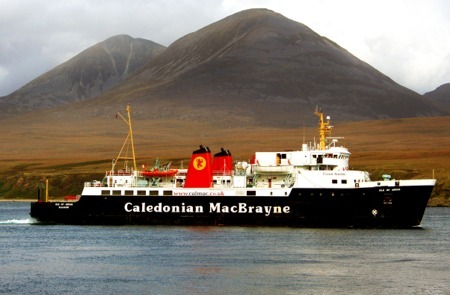 In 2001 as a result of something we featured in this very Bulletin, yours truly got very excited by an old CalMac ferry. Not content with suggesting the ship as a possible candidate for someone to live aboard, I followed this advice and took the plunge…. 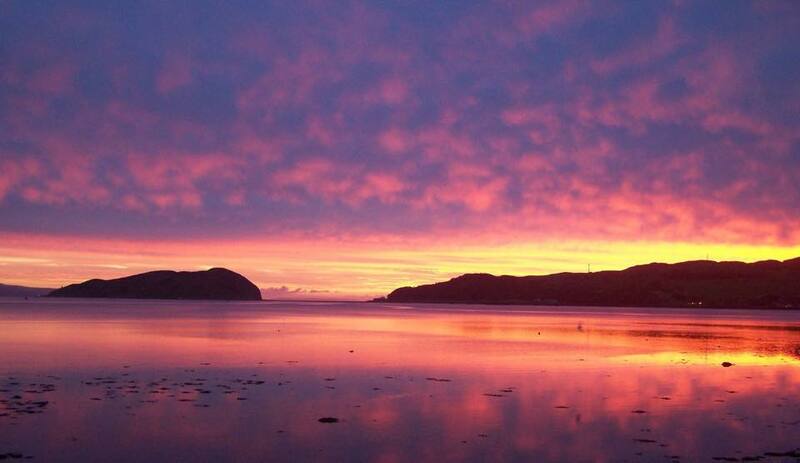 Waking Up To This – The Sea view of Davaar Island At Sunrise. Sublime. The photograph above was of an average sunrise aboard the ferry nice floating home. Some days were beyond the ability of description by mere words. So now, maybe we see where this narrative is headed. – to find an affordable home in the city? That memorable summer of 2001, living life on the water, has brought home how desirable such a style of life can be. So I would say.. The idea of combining three random things for this feature is part serendipity and hopefully food for thought. I will list a couple of the penultimate candidate properties that and short-circuit the London (or any major city) problem of finding a home. But before that here is a bit of a cliffhanger. I’m sure the majority of Bulletin readers get it: the idea of using lateral thought and mixing some ingredients to problem solve. But for a bit of fun, here is a competition. To get the old lateral thinking talent all you guys have, to flow. Back to this Unique Property Bulletin’s feature article and the metaphoric ingredients selected: (1) The 9,500 extra webclicks that occurred last month when we mentioned a London canalboat and berth for sale at £110,000 (here); (2) The sublime enjoyment of seeing a very big boat come home, and (3) Being laid up horizontally, with a dose of thinking time to fill. So what have we alighted upon? A process seems to thrive on lateral thinking. A Brief Summary of Lateral Thinking: Click Here. 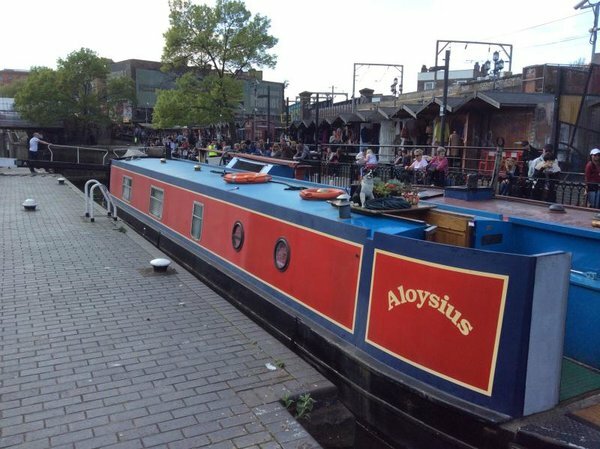 For this Unique Property Feature: we have cooked up one way of securing an affordable and unique place to live in London – or most major cities in the UK – to study, sleuth, rummage and locate a decent berth – then find a canalboat of your choice to live aboard at that mooring. As an added extra, if you don’t like the layout of a particular canalboat, you don’t need to go all Phil and Kirsty on it – pulling down walls, adding extensions etc. You don’t need to spend a mountain of money at B&Q; you certainly don’t need listed building or planning consent. Just visit your local canal boat dealership and trade the old home in for a new one. Though you should check out the rules about permanent residential moorings and your new wet home (here). The mooring charge for this example is approximately £3,900 per annum. It wouldn’t take long to find out how much a 3 bedroom flat would cost to rent in this area of London for a year. An interesting exercise in domestic arithmetic. 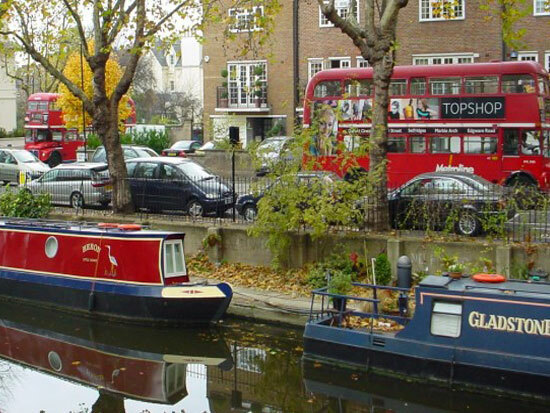 Canal Mooring & Boat Owner’s Sale Narrative: “This is one of the least expensive moorings in London. Berth is sought-after yet rarely available. Location is exile from the city, yet within it. Three Mills residential mooring is on a dedicated arm of the Three Mile Wall river, previously tidal, but changed to non-tidal in time for the Olympics in 2012. 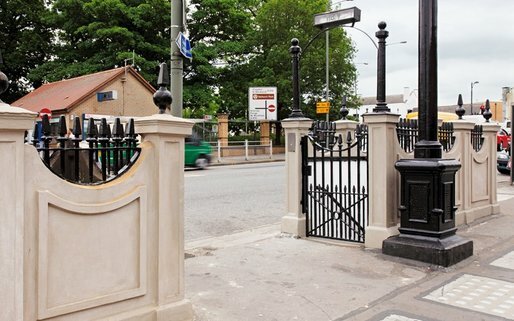 On one side is a wooded park, accessed via locked gates, through the 3 Mills conservation area and film studios. Walk over the canal bridge past our local Tesco to Bromley-by-Bow tube station on the District/Hammersmith & city lines, within 10 minutes of the boat.” More details here and here. 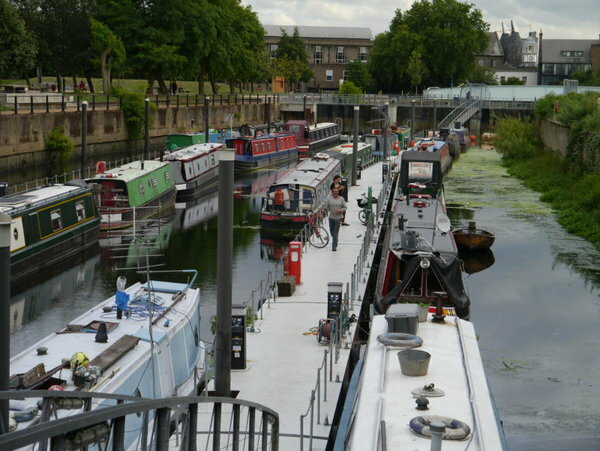 There are may canal boats for sale, and this article will be online for quite a while, so with the fluidity in the canal boat sale and mooring market, there isn’t too much point in listing a lot of vessels. This one example gives you an illustration of how it is possible to find affordable accommodation in a big city. These are just a few sources of boats to study and consider purchasing. Whilst we are at the canal-in-the-city thing. Here is another competition. Though the prize is more modest: a copy of the Unique Property Manual for each candidate canalside property you send in which we feature in the next Bulletin. The way to win is email us (here) with a city or town canalside berth for sale (it doesn’t have to have a boat included, that can get sorted out separately). The canal boats and canal brokerage listings are the one face of a two sided coin. The other is of course a place to moor your new home…. Or you could go the whole hog and buy a London commutable marina. Although studying the high specification homes afloat, and the location, we just might be straying into the enigmatic London guess-the-price game. This may be a little higher than the affordable £110,000 canalboat and mooring we set out to illustrate at the start of this feature. 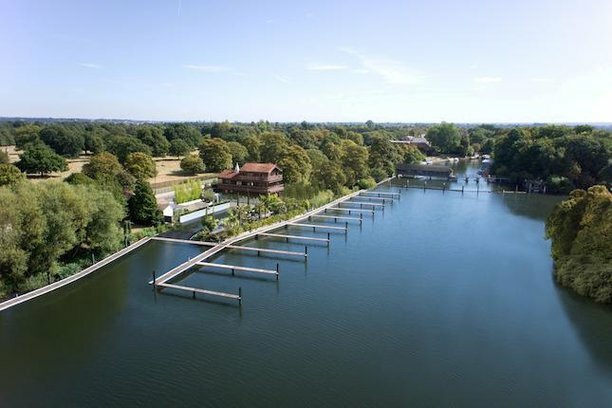 I know that for some of our capital readers, the following photographs may be a bit of an eye opener on what could be your dream home within the bounds of that M25 orbital…. 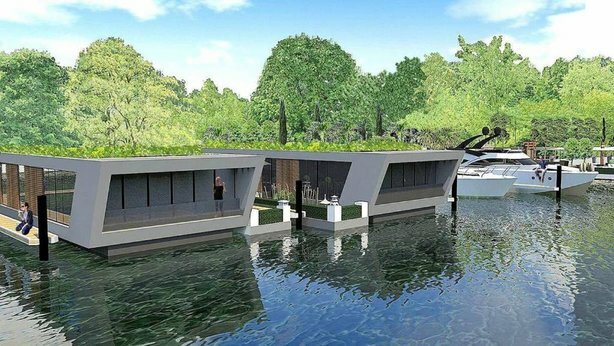 This interesting design takes life afloat to another level – and I don’t mean tidal. This somewhat lavish London centric Hampton Riviera item brings us to the end of another Unique Property Bulletin feature article. Hopefully by mixing some random and pretty unrelated ingredients together, this gives you food for thought. 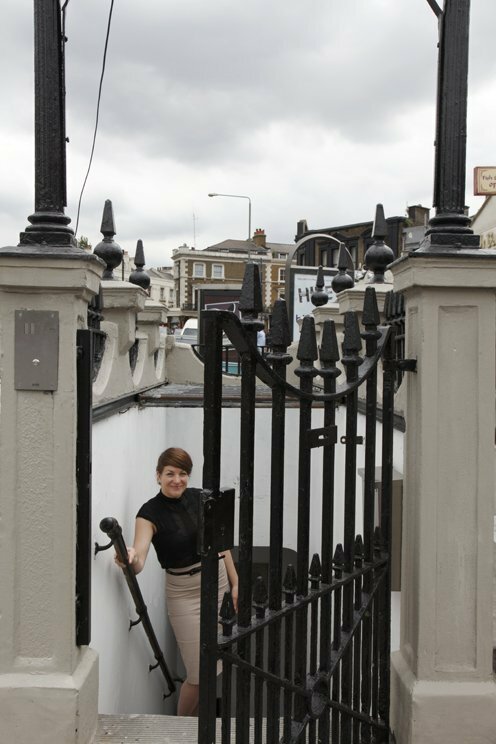 The fact that we have focussed on London a little should not be a restriction on applying the principles of lateral thought in locating a unique and affordable home in the city of your choice. Throughout the United Kingdom there is a wonderful array of canals. Many are unseen from the high speed motorwways, railtracks and airline routes. Even some city centres have canals running right through them that are quietly hidden from general sight. Perhaps now is a time for you to see if there is a canal or mooring near to the area where you are looking to live? Instead of a flat, or 3 bed terraced, it is well worth spending a while surfing the internet to see what floaty things can be found near to your search centre. Hopefully this edition’s feature article hasn’t given you too much postprandial somnolence after digesting all the words, photographs and links. Please let us know how you get on if this style of life afloat is to your taste (here). Next Full Edition At 9pm, 3rd July 2016.